If you run your own small business and all your interaction is with people from different companies, the experience is nothing like that. It’s easy to work around most of this, but when it comes to calendars, things can get really sticky. 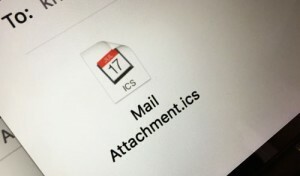 When someone sends you a calendar item, you will get an email that a Mail Attachment.ics file attached. This will happen whether it is to invite you to a meeting, there is a change to an existing meeting, or the meeting is being cancelled. The subject line of the email will tell you the title of the meeting, but often there is no content in the message body to tell you what this meeting is about or anything else. It’s a mystery! 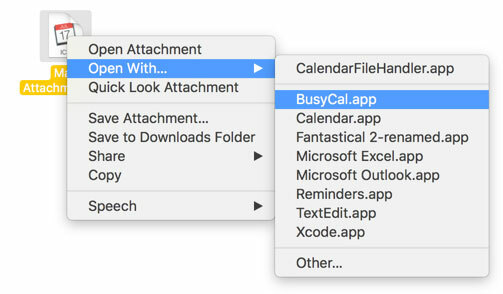 To find out what’s going on, you most open the attachment, but take note: opening the attachment will automatically update your calendar with the information that is in the file. Right click on the attachment, choose OpenWith…, then choose your current calendar tool. In the example below, I use “BusyCal” for my calendar, so that’s what I select. Depending on your system, this will open up your calendar with the action having been completed: If it was a cancelation, the meeting will be gone. If it was a new meeting or a changed one, the meeting will be there for you to open up and see.